This pattern is now available on my website at the link given here with an optional donate button if you have found it useful rather than paying in advance. I’ve converted the pattern to US terms and added instructions for a slightly fancier version of the toadstool shown with the purple top in the photos. This pattern is for a mushroom or toadstool with a ribbed underneath to represent the gills. They are made in one piece, starting at the base of the stem and working upwards. The only sewing involved is for the white spots on the toadstool. 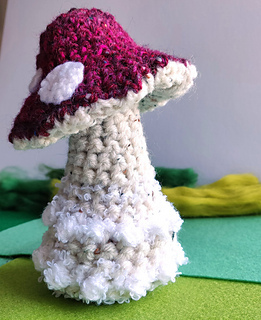 Red, brown and cream or white yarn and a suitable sized hook (I have used DK yarn with a 4mm hook making the finished toadstool ~10cm tall). 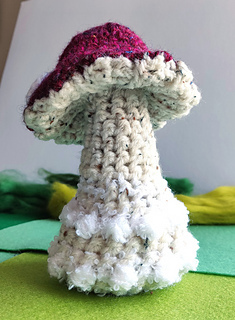 Gauge is not important as the finished mushroom/toadstool will vary in size with type of yarn/size of hook and tightness of crocheting. Magic ring, slip stitch, single crochet, half double crochet, double crochet, changing colour.